whereas Wellington is on the southwestern tip of the North Island. New Zealand has again been shaken by a series of earthquakes. The largest, at magnitude 6.5-6.6 struck Friday, and was followed by several smaller aftershocks with magnitude about 5. Although these are "moderate" sized-earthquakes, they are capable of causing widespread damage if near population centers. Fortunately, these were not and, also fortunately, New Zealand has strict building codes. Even so, chimneys collapsed, roofs caved in, and a bridge collapsed on a major state highway. The earthquake was 94 km west of Wellington, the capital, at 10 km depth was fairly shallow. Bill Fry, a seismologist with GNS in Wellington said that the quake was similar to a 6.4 tremor that struck in the same area on July 21, and appears to be a continuation of a sequence that started with some of magnitude in the high 7's. The most powerful earthquake in New Zealand's recent recorded history, a magnitude 8.2, struck Wellington in 1855, although there are stories of earthquakes in the Maori legends. Wellington sits on the coast and was thrust upward so far by the quake that the shoreline receded 200 meters. 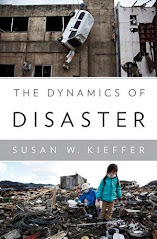 Here is a great site with details of many of the major earthquakes. New Zealand has a wide variety of active geologic phenomena--earthquakes, volcanic eruptions, geothermal areas, and landslides--because it sits at the boundary of the Australian and Pacific Plates. In the north (see graphic) the Pacific Plate is subducted under the Australian Plate, but in the south, the reverse happens: the Australian Plate is subducted under the Pacific Plate. 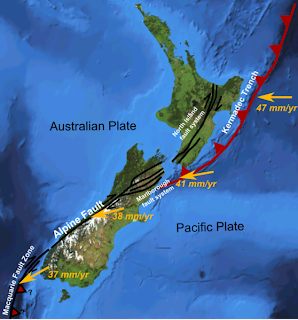 These two subduction zones are connected by the Alpine Fault that runs along much of the west coast of the south island of New Zealand. Subduction rates are high--tens of millimeters per year, but so are erosion rates. The mountains rise about 10 mm/year, but are eroded down at about the same rate. The combination produces some of the most beautiful mountains in the world on the south island. The Alpine Fault is considered to be at high risk of producing a major earthquake in the next 40 years (see GNS). Recent activity has been in the vicinity of the Marlborough fault system and, in particular, the M7.1 Canterbury (2010) and Christchurch (2011) earthquakes were on relatively minor faults. The fault system was named after the 1848 M7.5 earthquake centered in the Marlborough district of the South Island, a quake that produced substantial damage in the Wellington area as well. The European population of Wellington was approximately 4500 at the time; only 3 people died. Because stone and brick buildings suffered much more severe damage than wooden ones, for a time many buildings in the area were constructed of wood. But, after only 25-30 years, the institutional memory was lost and stone and brick buildings returned, partially encouraged by concerns about fire. At the beginning of the 20th century the country seemed calm, and the New Zealand Official Yearbook included the comment: "earthquakes in New Zealand are rather a matter of scientific interest than a subject for alarm." Quote from this source. The population of Wellington in 2012 was 385,600. Mount Rokatenda*** north of the island of Flores in Indonesia erupted on August 10, killing 6 people. It has been erupting since late 2012. Eruptions were generally VEI 3 in intensity. A 3 km exclusion zone was set up, and many residents of the island (~3000? according to an AP story) were evacuated, with many moving to the main island of Flores, but some refused to leave, growing used to the moderate volcanic activity. Scientific literature about this volcano is sparse, and the best that I found was "History of the volcanology in the former Netherlands East Indies" by Neumann van Padang, Scripta Geol. 71, pp. 1- 75, 1983. Reading this paper, with its four beautiful color plates brought back memories of the two famous photographers of volcanoes, Katya and Maurice Kraft who were killed in a pyroclastic flow during the eruption of Mount Unzen. Katya and I had roomed together at a field conference in the Caribbean. The first sighting of this volcano appears to have been in 1856 by Francis, who called it Luca Raja; Buddingh in 1861 called it Palowe. When spotted by Kemmerling in 1921 it has a "partly barren, partly wooded summit." Paluweh rises 3,000 meters from the sea floor, and is 875 m high above the water. It has the classic, though somewhat asymmetrical, stratovolcano conical structure though appears highly gullied from the topo map in Padang's figure 13. The summit region has a complex of small cones. These appear to be somewhat south of the main summit (see figure to the right). Documented eruptions were in ~1650, 1928, and 1972. ##. Ash and pumice, estimated at 19.5 million cubic meters (corresponding to about 4.6 million cubic meters of lava) were erupted, and a new lava dome of about 8 million cubic meters as formed. Paluweh erupted in August-September 1928. The eruptions took place from a collapsed area south of the summit where six ancient craters and three lava domes had been found. During the August eruption three new craters were formed, and a fourth on September 9th. During the august eruptions there were "sea waves" with heights of 5-10 m (tsunamis) that attacked the island itself, killing 128 people out of the total population of 266. Flores is near the eastern end of the Indonesian arc, west of East Temor and northwest of Darwin, Australia. The geology of Indonesia is extremely complicated. It lies at the intersection of three of the major lithospheric plates: the Indo-Australian Plate, the Philippine Plate, and the Eurasian Plate. These plates intersect at angles, leading to a complex network of faults in the region (and to the intense earthquakes that plague the area). These collisions produce deep trenches (Java, Timor, and Philippines Trenches) and island arc volcanoes. Simplified plate boundaries in Indonesia. intersection of the Java and Timor Trenches. ***In researching this, I found different spellings: Rokatinda, Paluweh, Paloweh, Palu'e, Luca Raja, Palowe. In the article referenced above, I think that the stratovolcano and the island that it occupies are referred to as Paluweh, and the summit crater as Rokatenda and I follow that nomenclature here. The "Palu..." names were Dutch origin; the Rokaa... names were the new Indonesian names. It is about 1250 miles east of Jakarta. ##The population now is estimated as about 10,000. Here are other references to this volcano: The Smithsonian Global Volcanism Program here. 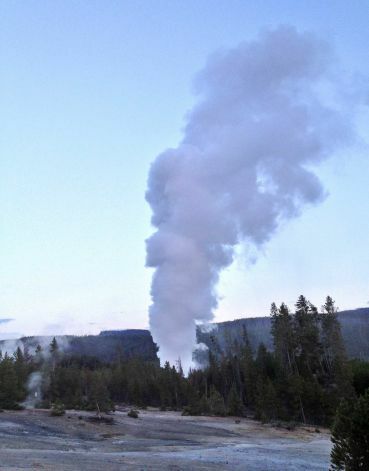 One of Yellowstone's most spectacular geysers erupted today, making headlines in major newspapers and radio news shows. Why such a fuss? Steamboat erupts to hundreds of feet, but only rarely and never predictably. Having worked in Yellowstone studying the geysers, I can imagine the excitement of the tourists as they hear the roar of the geyser erupting, see the towering plume, and perhaps get showered by its steam and droplets (hopefully not by any entrained rocks or sand). I wonder how many have glasses or camera lenses that now bear witness to the chemicals in Steamboat's water with fine deposits of minerals precipitated when that water evaporates? What is a geyser? Is Steamboat really a geyser or should it be called a "hydrothermal explosion?" Geysers are usually defined as systems of hot water that intermittently ejecta some or all of their water into plumes consisting of water and steam. Geysers lie along a spectrum of thermal features that range from hot springs (warm to scalding) on one end and fumaroles on the other. A fumarole spouts dry or wet steam, usually continuously, but sometimes intermittently. Geysers can be thought of as hot springs that intermittently eject the hot water from their reservoirs. What does the reservoir of a geyser look like? We don't know for most geysers as it is difficult and dangerous to try to find out. However, in the 1990's, with the permission and assistance of the National Park Service, we lowered an ice-cooled miniature video camera into Old Faithful. This was in the days before truly miniature videos were available, and our system had to be less than 4" diameter to pass through a known constriction, had to contain its own lighting system, had to be cooled with ice because it was in an environment of 92 C steam, and had to have a heated lens to prevent condensation on the otherwise cool unit. My colleague Jim Westphal at Caltech cleverly designed the system. From this work, we were able to constrict the cross-section of Old Faithful shown to the right. The reservoir is a tortuous series of narrow and wide spaces. Researchers in Russia have probed geysers there and found similarly complex conduits, and it is likely that the reservoir of Steamboat Geyser is a similar complex of caverns and constrictions. That word "intermittently"in the definition of a geyser is taken by many to mean "regularly" and somewhat "predictably." So, tourists get used to the fact that the National Park Service can tell them within about 10 minutes or so when Old Faithful is going to erupt; and within several tens of minutes or several hours for a number of the other geysers around Yellowstone. So, what is Steamboat? It is a geyser if the word "intermittently" is used properly. But, the eruptions are so rare that they do resemble those rather nasty events called "hydrothermal explosions." The term "hydrothermal explosion" is usually used to describe a new feature--one that has popped up where no known feature, such as a geyser, existed before. The vent of Steamboat is so large that it is well-known, and the boardwalk for tourists passes right by it so one can look down on its vent. But, just as some tourists probably got taken by surprise if they were close to Steamboat when this mighty eruption (reported to have been 200-300 feet high for 9 minutes) took off, tourists in the thermal basins are always at risk of a true hydrothermal explosion. That's one reason for staying on the boardwalks constructed for walking through these basins--they are built in areas deemed as safe as possible from future surprises. **Reference: Hutchinson, R., Westphal, J., and Kieffer, S., In situ observations of Old Faithful Geyser, Geology, 25(10), 875-878, 1997.